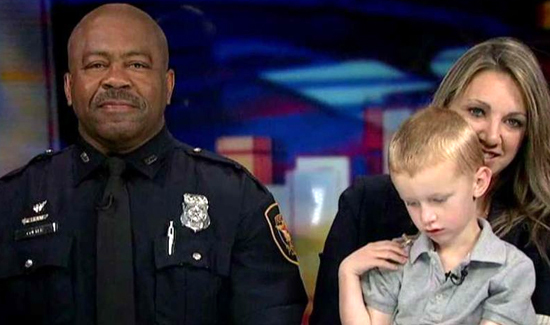 Forth Worth police Officer Anthony Colter was taking a break at a local McDonald’s when he noticed he’d caught the attention of a child nearby. Jamie Hubbard told NBC’s “TODAY” she eating with her son, TJ, last week when she noticed he’d become fascinated by seeing a real-life police officer. “TJ kept looking at him and his helmet,” Hubbard said. Colter, a motorcycle cop, said the boy wanted a ride on his bike, but Colter offered the 3-year-old a police badge sticker instead. The officer also made sure to let TJ know he considered him his “helper” for the day.